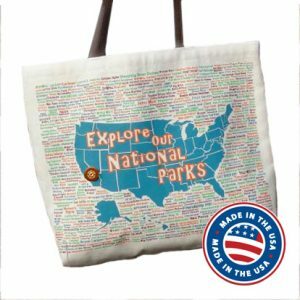 This 100% cotton canvas bag features over 400 National Park Service sites. It’s the perfect tote bag for any national park enthusiast. The design highlights parks, monuments, trails, battlefields and more. Includes a national park button (not specific to a site). Retail store managers may special order bags with site-specific buttons by emailing: games@jr-rangerland.com. Order minimums apply. Designed for those ages 14 and older. Not intended for children. Dimensions are 18” x 14.5” x 3” with 25” handles.